This week I have mainly been working on simple things - hence the title of the post ;-) This is because I have been helping a friend tech edit her pattern and this is using most of my brain power. Plus, I haven't been very well over the last week. I spent most of Monday in bed feeling sorry for myself, not even able to tolerate the radio. That's when you know I'm really sick, when I don't even listen to music. I'm starting to feel much brighter now, but it has left me without much that is interesting to show you. 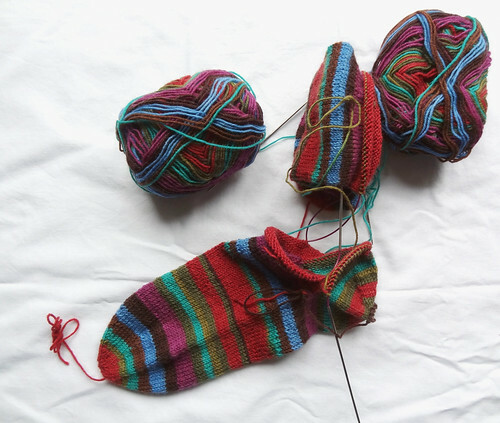 Here are my Kaffe Fassett yarn socks. I have finished the foot and I'm now onto the leg. This way of doing socks looks really odd until you put them on your foot. 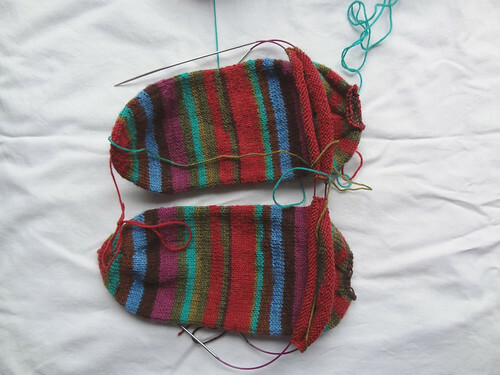 Here is the sock flatted sideways. It looks a little more like a foot this way, doesn't it? I do love this yarn. The colours are much brighter than I normally go for. I think I'm starting to be drawn towards bright socks, as I find them so cheerful to have them on my feet. 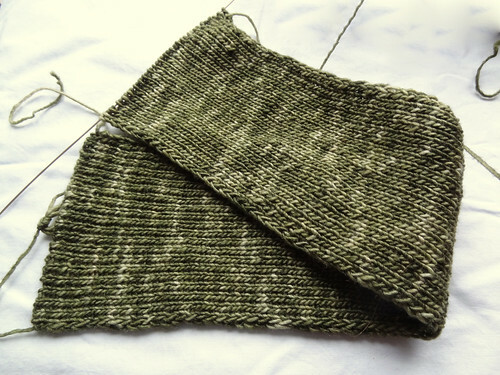 Next on my simple things list is my simple ribbed scarf. I made the scarf too wide initially, so after a few inches I did some maths and realised I would get a very short and wide scarf and that wasn't what I wanted. I ripped back and cast on 41 stitches instead. This seems to be about the right width and will make a nice long and loopy scarf. This scarf has been perfect "getting over feeling poorly" knitting. There is nothing more soothing than 1 x 1 ribbing in delicious yarn on nice slick needles. The fabric of the scarf is coming out beautifully. The new method of casting on has worked a treat as well. I'm definitely keeping that one in my toolbox of tricks for the future. I have made progress on my crochet project as well. I have nearly finished the body of my Teal Bird. The pattern uses yellow for the beak, but I haven't been able to track down a yellowish colour that would work, in this yarn, so I have ordered some black yarn. I think it will come in useful for further projects. If it doesn't get used, it hasn't cost me very much as this yarn is pretty cheap. I'm glad I used it because the body of the bird is really squishy, even without putting the stuffing inside. 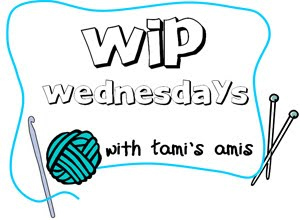 I've stalled at this point, until the black yarn arrives, as I want to have the beak made up before I add the wings and eyes. At that point I will go back to my Craftsy class and learn the best way of attaching the bits to the body. It will be interesting to see if there are any special techniques that I've not used before, as most of the toys I have made before have been knitted. I am really looking forward to seeing this birdy finished. I think it's going to look so cute. So there you have it. Three simple and straight forward projects to occupy my hands whilst my brain rests after tech editing maths work. I do love that about crafting - there is a project for every occasion! 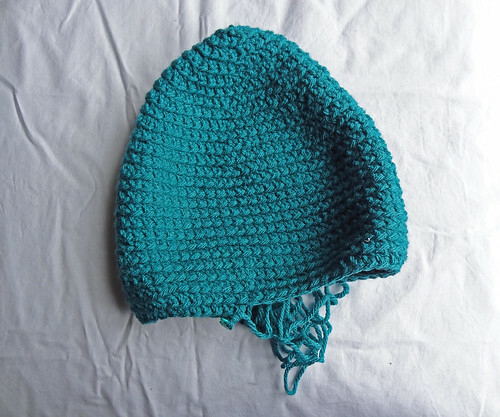 To see other crafters' projects, click on the button!